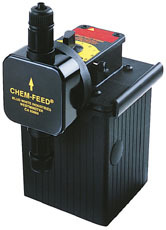 The diaphragm back-up washer on Westminster, Calif.-based Blue-White’s CHEM-FEED C-1500N NOIR Series metering injectors has just undergone a design change. The thickness of the material has been increased, eliminating the need for a spacer and increasing the diaphragm’s strength, particularly at higher pressures. The injectors are fitted with the company’s exclusive heavy-duty head with Bullet Cartridge Valves, constructed of PVDF plastic.